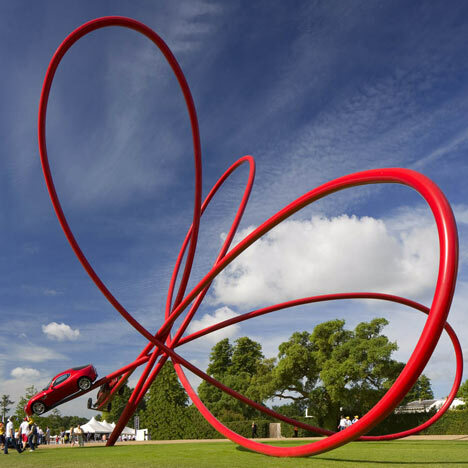 Designer Gerry Judah has created this bright red looping structure for Alfa Romeo at Goodwood Festival of Speed, which took place in West Sussex last weekend. The sculpture marked the car brand's centenary and features two iconic Alfa Romeo cars, from the past and present, at the end of a series of loops. The form of the sculpture is inspired by the Cloverleaf badge found on the cars. Read about Judah's previous Goodwood Festival of Speed sculptures here and here. Photographs are by David Barbour. This is the Alfa Romeo Centenary Sculpture displayed at Goodwood Festival of Speed 2010. The designer of the sculpture Gerry Judah www.judah.co.uk says: “With such a vast rich heritage, trying to encapsulate all that is great about Alfa Romeo was no easy task. So many factors played a part in the creative process, from the beauty of the cars themselves which are often art forms in their own right, to the passion the marque shows and holds in so many hearts. I felt it was important that the sculpture complemented and expressed these messages. The perfect way of communicating this was to use two of Alfas most iconic cars – past and present – the P2 and the 8C Competizione – both legendary in their own right with the connection of the first and most recent Alfa Romeo to feature Alfa’s eight-cylinder engine. Apart from creating a strong dynamic, it was important to translate their connection. Representing the best of all that is Alfa Romeo, there was no better symbol to take inspiration from than Alfa’s famous Cloverleaf badge, which has donned past and present high performance Alfa Romeos. The easiest part of this project was choosing a representative colour – which of course had to be Alfa Red“.